Paper notebooks are cool, with their playful cover artwork and old-school feel. Digital notebooks are efficient, with their easy to share, easy to read (usually easy to find) data storage. With Rocketbook Wave, there’s finally an intelligent—and awesome—combination of the two. Created by Cambridge University grads, this physical-meets-digital creation is the best of both worlds. You get a natural handwriting experience for taking notes, brainstorming, doodling and more. You also get simple Cloud storage that transfers your pages into bright, clear images. The best part? When every page is packed, you get to start all over again. 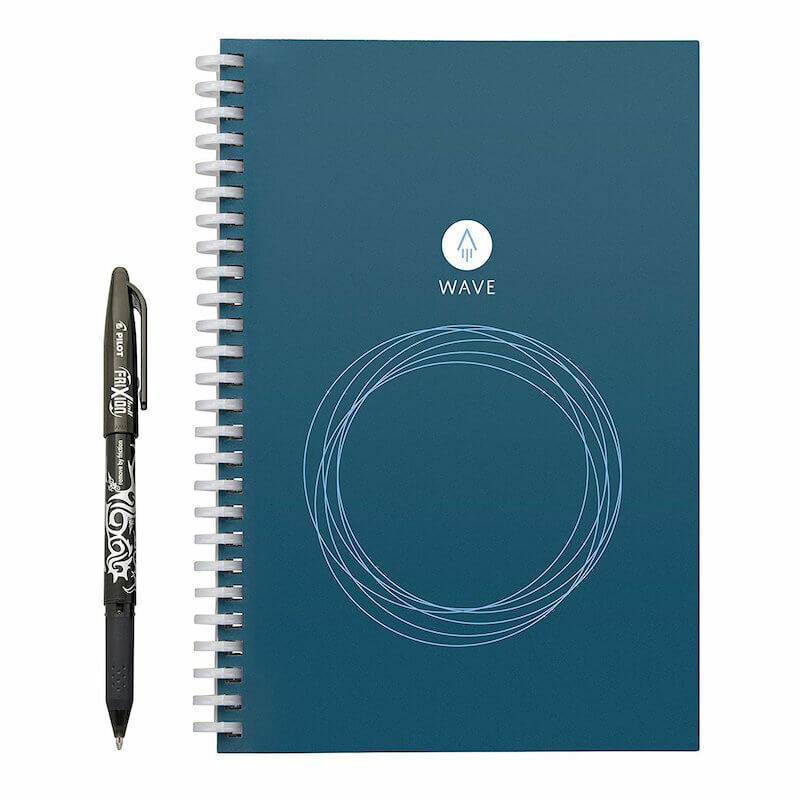 The Rocketbook Wave is truly the first of its kind in existence. Each notebook comes with a FriXion pen, designed to be used with the gradient paper of the notebook. Take notes and write in the Wave as you normally would, and take note of the seven symbols along the bottom of the page. These are a big part of how the Wave goes digital, after all. Use the Rocketbook app to assign the seven symbols to your most-used, most-loved Cloud services. These might include Dropbox, Evernote, Google Docs, OneNote, or your email address. Back at the Rocketbook Wave, draw an “X” over the symbol for the Cloud service you want to transfer each page to. When you’re ready, simply take a photo in the app with your smartphone. Like magic, each page delivers straight to your chosen service, looking bright, enhanced and fully optimized for your screen (so no yellow tint or shadow). It’s that easy. When you’re done, casually set your notebook in the microwave with a mug of water and watch all your writing disappear, allowing you to start over again. Joe Lemay and Jake Epstein loved the process of handwriting notes and ideas during brainstorming. Yet, they knew these traditional pads had their drawbacks. If you left your notebook behind, all your work was gone, too. If you needed to transfer your notes to a digital format, you had no choice but to manually type them up. Worse yet, when the notebook you’d been carrying for weeks was full, you had to buy another (and bring the original along, too). Rocketbook is the answer to this dilemma. In 2015, the Rocketbook Wave made its debut on Indiegogo, raising over $1 million dollars toward launching the notebook. In 2016, they returned with a Kickstarter that raised more than $570,000 for the product. It’s not just cool tech people who are noticing this brand, either. Rocketbook has been featured in Fortune, Bloomberg Business, USA Today, FOX Business and many other media outlets. NBC, McKinsey and Cisco have purchased bulk custom orders for their employees. This little notebook comes in two convenient sizes (one for the office, one for travel). Its reusable design has already made waves and continues to gain momentum. This notebook is designed to be the bridge between the physical and digital world, with a futuristic twist created to be even cooler. Or hotter, we suppose. It is microwaveable, after all.